Home » national news » Live - West Bengal election 2016 results: Will Mamata retain power? Live - West Bengal election 2016 results: Will Mamata retain power? As per exit polls, Mamata Banerjee will comfortably retain West Bengal. And going by the same prediction, BJP has once again failed to make any major headway in the eastern state, despite a high pitched anti-Mamata campaign spearheaded by top party leaders. As we wait for the results, here's a fact sheet of what you need to know about the key constituencies and clashes in this very crucial state that has 294 Assembly seats. 1. Dilip Ghosh, BJP state president, fought it out with 10-time MLA from Kharagpur, Sadar Gyan Singh Sohanpal of the Congress. TMC fielded Ramaprasad Tewari from the constituency. 2. Tollywood star Soham Chakraborty made his electoral debut from Barjora, Bankura, on a TMC ticket. He contested against CPI(M)'s Sujit Chakraborty and BJP's Sujit Agasti. 3. Footballer Bhaichung Bhutia contested on a TMC ticket from Siliguri against Dr Geeta Chatterjee and CPI(M)'s Ashok Bhattacharya. Bhutia had unsuccessfully contested the 2014 Lok Sabha election from Darjeeling where he lost to BJP's SS Ahluwalia by 196,795 votes. 4. Tollywood actress Locket Chatterjee contested on a BJP ticket from Mayureshwar. She will lock horns with TMC's Avijit roy and CPI(M)'s Arup Bag. 5. Veteran Congress leader Somen Mitra fought it out with sitting MLA of Chowringhee and TMC leader Nayana Bandopadhyay, in Chowringhee. Mitra had a brief stint in TMC as did his wife Sikha Mitra, who won the Chowringhee seat in 2011. She defected to the Congress in 2014. 6. TMC's Smita Bakshi and sitting MLA of Jarasanko was up against former BJP state president Rahul Sinha. 7. Kamarhati, North 24 Paragana, saw an interesting clash between former TMC minister and scam-tainted leader Madan Mitra and BJP's state spokesperson and media in-charge, Krishanu Mitra. The Sharada chit fund scam accused contested the election from behind bars. 8. BJP fielded its state Mahila Morcha chief, Roopa Ganguly, from Howrah North. She was pit against another celebrity candidate and former footballer, Laxmi Ratan Shukla, from the TMC. 9. The daughter of cricket administrator Vaishali Dalmiya contested on a TMC ticket from Bally constituency. She was locked in a triangular fight with CPI(M)'s Anjan Bera and BJP's Kaushik Chakraborty. 10. From Basirhat Dakhin, TMC's Dipendu Biswas fought it out with BJP's Tarfan Ali Gazzi. Biswas, former soccer captain was trounced by a narrow margin in the Basirhat Dakshin bypolls in 2014. BJP had made history by winning an Assembly seat in West Bengal then. The seat gave BJP its only MLA in the state in 15 years - Samik Bhattacharya. 11. 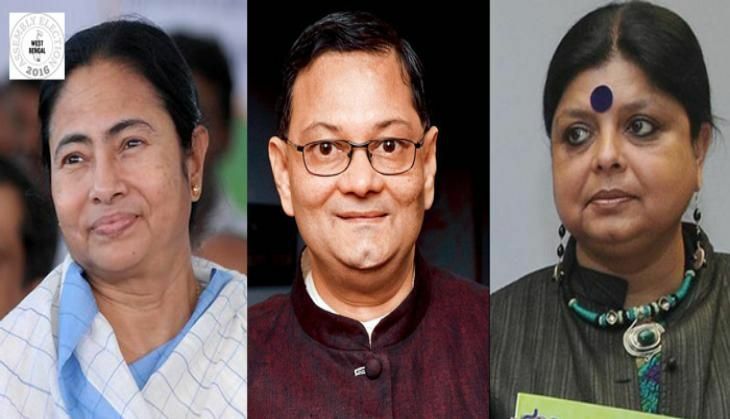 The triangular contest between Chief Minister Mamata, Congress' Deepa Dasmunshi and BJP's Chandra Bose was one to watch out for. While most political pundits said Dasmunshi and Chandra Bose had a difficult task cut out for them as defeating Banerjee, who was contesting for a second run as CM, is next to impossible. Banerjee had chosen Bhabanipur as her constituency after becoming the chief minister in 2011. TMC leader Subrata Bakshi vacated the seat for her. She won the by-polls with a huge margin, winning close to 78 % of the vote share. However, BJP did pull off a good show in Kolkata South in 2014, coming second to TMC. 295,126 votes were polled in favour of BJP candidate Tathagata Roy, currently the Governor of Tripura. 12. CPI(Marxist)'s Sujan Chakraborty fought it out with TMC's Manish Gupta from Jadavpur. Chakraborty had won the 2014 Lok Sabha elections from the constituency. 13. The hot-bed of land rights movement against Tata Nano factory in Singur had played a huge role in helping Mamata Banerjee overthrow the over three-decade rule in West Bengal. From this seat, sitting MLA and TMC minister Rabindranath Bhattacharjee was up against CPI(M)'s Rabin Deb and BJP's Suren Patra. 14. Partha Chatterjee won the Behala Paschim constituency seat since 2001 and hopes to win this year as well. His opponent is CPI(M)'s Kaustav Chaterjee. 15. Seventy-year-old Abdur Razza Molla contested from Bhangarh, South 24 Paragana on a TMC ticket. A recent import from CPI(M), he was expelled from his former party in 2014 for anti-party activities. He has been the undisputed king of Canning Purba from the same district between 1977-2011. His opponents were the Left Front's Rashid Gaji and BJP's Abani Kumar Mandol. 16. Popular Tollywood actress Debashri Roy was TMC's star candidate from Raidighi. This was her second consecutive electoral battle against former CPI(M) minister Kanti Ganguly, whom she defeated from the same seat in 2011.